Holland America Line have announced that Summer 2016 bookings for its upcoming cruise ship are now open. 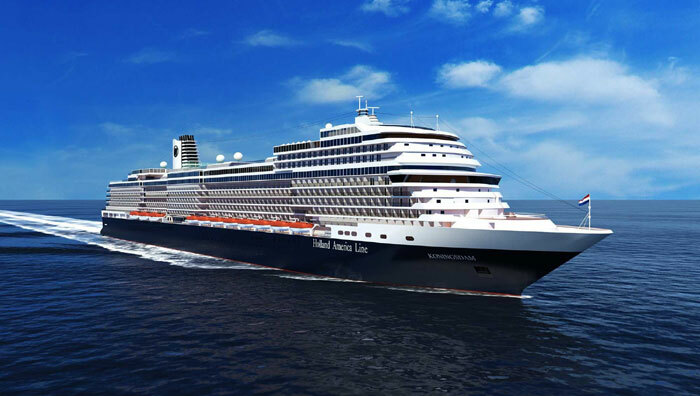 Starting Friday, Feb. 6, guests can make bookings for the summer 2016 European cruises of Holland America Line’s newest ship, ms Koningsdam, launching in February 2016. In addition, the line has announced details of the ship’s 13-day Christening Cruise, departing May 9, 2016, from Civitavecchia, Italy, to Amsterdam, the Netherlands, which also will be available to book Feb. 6. From May throughout the summer, the ship will sail roundtrip from Amsterdam on itineraries to Norway, the Baltic, British Isles and Iceland. The May 9 Christening Cruise will feature the ship’s official naming celebration on May 21 in Rotterdam, the Netherlands, followed by an overnight at Amsterdam. Koningsdam‘s Premiere Sailings in the Mediterranean that run February through early May 2016 opened for booking in December and have been very popular. From its summer homeport of Amsterdam, Koningsdam will begin a series of seven- and 14-day cruises to Norway that showcase the country’s stunning scenery and dramatic fjords. In August, the ship sails a British Isles and Iceland itinerary that features three calls in Iceland and visits to ports in England, Scotland and Norway. On two 14-day itineraries in June and September, guests can embark on a journey to the Baltic and visit historical and cultural sites in Denmark, Germany, Estonia, Russia, Finland and Sweden. The ship’s fall and winter itineraries will be announced in the coming months. The ms Koningsdam is a new Pinnacle class ship for Holland America and is currently being constructed at the Fincantieri Shipyard in Marghera, Italy. Once its complete it will be 99,500 gross tons making it the largest in the fleet.